(Nanowerk Spotlight) Nanopores function as membrane channels in all living systems, where they serve as sensitive electro-mechanical devices that regulate electrical potential, ionic flow, and molecular transport through the cell membrane. Scientists are studying nanopore construction with the goal of making man-made cell membranes and single molecule detectors. So far, nanoporous membrane-based separations simply use the difference in size of the analytes relative to pore size in the membrane. Here, for a nanopore to be useful as a single molecule detector, its diameter must not be much larger than the size of the molecule to be detected. When a single molecule enters a nanopore in an insulating membrane, it causes changes in the nanopore's electrical properties, which then can be detected and measured. In a recent Spotlight we wrote about single-molecule spectroscopy using nanoporous membranes ("Sucking nanospaghetti through nanopores - the art of single-molecule spectroscopy"). In order to bring about selectivity beyond size, it is necessary that methods for functionalizing the membrane pores are available. To that end, researchers have developed a very simple, but versatile, method for decorating the nanoporous membranes with functional groups. By uniformly modifying the internal cavities of nanopores with various polymers they were able to demonstrate selectivities based on size, charge and hydrophobicity of the molecule passing through the nanopore. "Incorporating specific functional units within a nanopore provides an opportunity to differentially interact with another molecule that could flow through these pores" Dr. Sankaran Thayumanavan tells Nanowerk. "Since the functional group itself can be tuned, we can tune the level of interactions that a particular molecule will have with the pore walls of the membrane. This in turn translates into our ability to discriminate one molecule from another within the pore." The fact that this discrimination was achieved in a nanoscopic space provides two key advantages: 1) the confinement in nanoscopic space enhances the opportunity for the functionality in the pore wall to interact with the molecule passing through; and 2) the fact that this is nanoscale provides an opportunity for high sensitivity with low volume samples in applications such as sensing. Thayumanavan, an Associate Professor in the Department of Chemistry at the University of Massachusetts Amherst, has published his findings in the February 3, 2008 online edition of Nature Nanotechnology ("Molecular discrimination inside polymer nanotubules"). Thayumanavan explains that electroless gold plating is one of the most reliable methods currently available to adjust the pore size of polymer membranes. "This method provides the opportunity to fine tune the pore size by adjusting the gold deposition time" he says. "However, these nanopores separate molecules mainly based on size. Functionalization of these nanopores is essential for selective interactions based on charge and hydrophobicity. This is generally accomplished by thiol modification and functionalization of the gold surfaces. While this method is very useful from the precise pore size control perspective, a complementary method for functionalizing the pores will be useful, because the electroless gold deposition procedure is time-consuming (∼ 24 hours). Moreover, the thiol-functionalization of the gold surface inside the nanopores has been found to be often incomplete. The electrical double layer formation due to the metal also renders the predictability in separations difficult. Therefore, a complementary method for nanopore functionalization, such as the one developed by us, will be valuable." 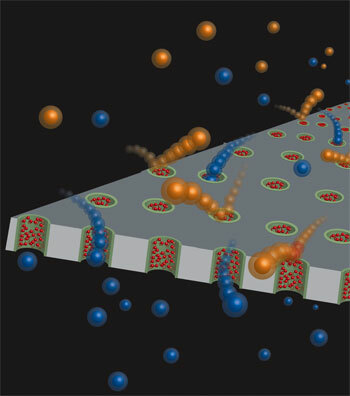 An interesting feature of the UMass scientists' design is that the pore size of these membranes can be tuned, while simultaneously functionalizing the interiors of the pores. "In order for this process to be versatile, it is essential to have the capability of tuning the pore size when needed" says Thayumanavan. "For example, separation of small molecules will be more effective if pore sizes are even smaller, because the encounter between the analyte passing through the pore and the functionalities in the membranes will be better." Functionalities within nanochannels are interesting in applications for molecular recognition, because they provide a higher probability of interactions with a complementary molecule passing through the channel. Combined with a simple approach for functionalizing nanoporous polycarbonate membranes, Thayumanavan's technique could have broad implications in areas ranging from biomedical diagnostics to membranes for fuel cell applications. "We view this as a new 'platform technology'" says Thayumanavan. "What we mean by this is that there are a multitude of opportunities that this work presents. In our group, we are focusing the utility of this method to work on sensing, separations, and to address some fundamental questions in fuel cell membranes. The latter application is a big part of our work, in light of our recently awarded NSF-Center for Fueling the Future." Not surprisingly, there are quite a few challenges. The fundamental and immediate challenge is to incorporate more specific functionalities and inquire whether these interactions could be rendered highly specific. Furthermore, could these interactions be then coupled to a transducer to get a signal that could be useful in sensing? This methodology will provide versatility for a variety of applications that people have worked with using nanoporous membranes, except now they could do it with specific functionalities incorporated within the nanopores' interiors. Overall, this novel method is limited only by synthetic polymer chemistry in incorporating functional groups onto a polymer chain, the inherent ability of which is vast and growing.